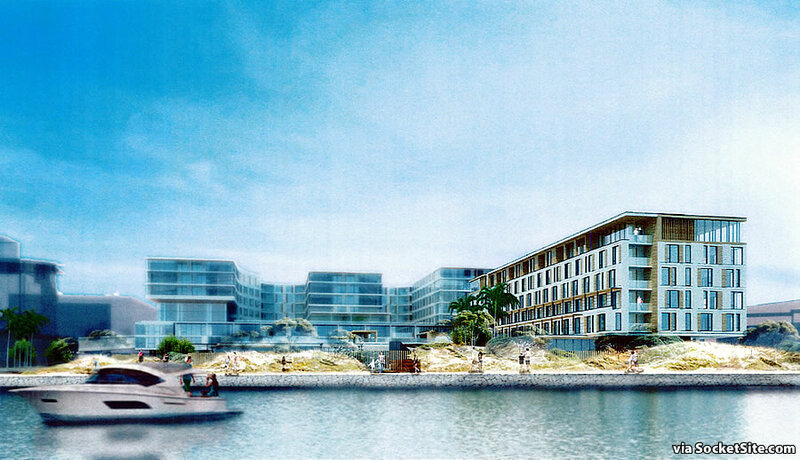 With the proposed 326-unit building to rise up to eight stories in height on the Jack London Square parcel known as “F2” softly rendered in the background, the design for a proposed waterfront hotel to rise up to 67 feet in height on the adjacent parcel known as “F3” has now been rendered as well. And the hotel’s meeting and event space would sit at corner of Water and Harrison. “The proposed project is an attractive hotel design with components of a destination resort. The expansive grounds and separate bar and restaurant, along with amenities like an outdoor pool and possible event space, suggest a luxury recreation and entertainment experience more than a modest economy hotel or motel facility. A luxury, destination hotel would be a beneficial use in the Jack London District and for the Oakland community, attracting visitors to the city and activating the waterfront consistent with long-term City goals and objectives. We have a prime Oakland waterfront site with a direct view of the SF skyline and Oakland gets a motel looking structure out of it? Come on. This is Jack London Square right on the water. Talk about selling Oakland short. We desperately need quality hotels in Oakland. We don’t need a squat looking motel on prime waterfront land. Motel looking? let me hip you to something…that above is exactly what 30 something people on expense accounts at whatever LLC, and Associates, or inc. are looking for. Besides that, a monolithic 20-30 story building would be out of place and, to turn a phrase, a “wall on the water front” of Oakland. A tall slim hotel set back on the parcel would look just fine. Take a look at the Baltimore Inner Harbor for an example of what the Oakland waterfront could look like. Also, Brooklyn Basin, just down the Estuary from this site is slatted for mid and highrise buildings. All they would really have to do is pick up one end of that building and stand it up vertically. All of a sudden we would get better views and more surface area below. As is the F2 views don’t look like they would be affected by adding height to the current hotel footprint. From looking at the rendering the hotel is set to the east of the F2 project and not blocking views. Look at the third rendering, the one that depicts what street level would look like. Drop a big tower on that site and you’ve got that 70’s to 90’s sterile streetscape. …others can argue space vs place better than I can, but I will say that Baltimore inner harbor is exactly what people don’t want, the silo hotel tower on the edge of big plaza is not whats wanted. The rendering shows an exterior with probably seven or eight distinct places. I think Formerly Native hit the correct point. It will get used by business people, not tourists. Unless, they can’t afford SF. I know E. Gonsalves thinks that Oakland is superior to SF in every way on paper and tourists *really* want to go there – but they never will. Nobody ever says “I want to go to California/Bay area to see the rich history and architecture of Oakland!” Oakland will always be there to feed into SF with more affordable housing and businesses. I think tourists would really want to come to Oakland if they knew what Lake Merritt, Jack London Square, Old Oakland, Uptown, Temescal, Rockridge, Piedmont Avenue, Redwood Regional etc. looked like and were like. The average tourist is not informed about Oakland. They (tourists) really wouldn’t come if they knew. I know about all those things, and couldn’t care less about going there to see them. I never bother taking out of town guests there. They’re not that interesting – and certainly not as interesting as SF/Marin and Napa/Sonoma. You’re simply wrong – and that isn’t to denigrate the areas you’ve listed. They’re pleasant enough, but they’re simply not going to draw tourists away from San Francisco’s Chinatown, Union Square, North Beach, Ferry Building, waterfront, etc. that_dude, even without your massive influence tourists still spend about $2 billion a year in Oakland. We have a nationally recognized food scene, decent night life, a great airport and transit, one of the most respected zoos in the nation and venues for just about every outdoor activity. We have friends in Oklahoma City that have read about the Fox Theater and Temescal. Every time I bring someone new here they’re floored by what Oakland is really like. While it’s far from perfect, Oakland is still a place people choose to come to and not just because they can’t afford SF (how rude). I’ve had visitors from NYC comment on how beautiful the architecture in Old Oakland is. Frankly there is nothing like 9th Street in Old Oakland or the preserved victorians in Preservation Park in SF. Oakland has a 1700ft obervation area at Grizzly Peak. The Marin Headlands and Twin Peaks are 900ft. There is nothing like the 13 mile scenic drive on Grizzly Peak and Skyline Blvd in the Oaklanf hills inside SF City limits. This scenic drive in Oakland is more lush with better views than Mulholland Drive in LA. The Oakland Zoo is the best Zoo in Northern California and now has a bran new gondola which takes you up to a hillside restaurant with magnificent views. Actually about 25M visitors care about the EBRPD, so unless you’re rounding to the nearest billion, it’s more than “no one”. That you haven’t even heard of it doesn’t surprise me much, but perhaps you should consider making use of some of the educational programs they offer. For what it’s worth, I’m frequently a tourist in Oakland, partly because it is easy to reach. But then again I’m also not a typical tourist. Oakland has a great climate amazing regional parks, beautiful views, interesting topography, etc., there are plenty of things to do in Oakland. The problem with Oakland is that it lacks the funding to promote itself along with the infrastructure to host large conventions. There are not nearly enough hotel rooms in Oakland. The City of Oakland is losing out on its fair share of the huge tourist industry in the Bay Area. This hotel will be perfect for rail nuts (not that you’re on of those, MoD). Also a nice ferry ride into Ess Eff for the tourists who are boat nuts! EBGuy – Haha. But the locomaniacs already have front row seats at the Jack London Inn. Great project. This is unique – something SF can’t provide. A large waterfront resort venue. Waterfront projects always have a special cache. At first glance, I thought that someone had just put a chunk of the old Jack Tar on Van Ness on a barge and dumped it at Jack London Square. If you can’t go to Miami, Miami can come to you! How remarkably unevocative of Oakland…and what a slide downhill . 17 years wait for this? Boo! hiss! “Landscaped dunes”? What are we now, a beach town? Will be a great spot for pool parties. Wow, that is pretty craptasitc. It’s like Vegas decided to throw up on Miami strip mall. Why not go glass, like F2, and take advantage of the waterfront location? At least then it won’t look like a motel. No one makes glass motels. The overall concept is fine, fun even, but the building itself could use a little more character. 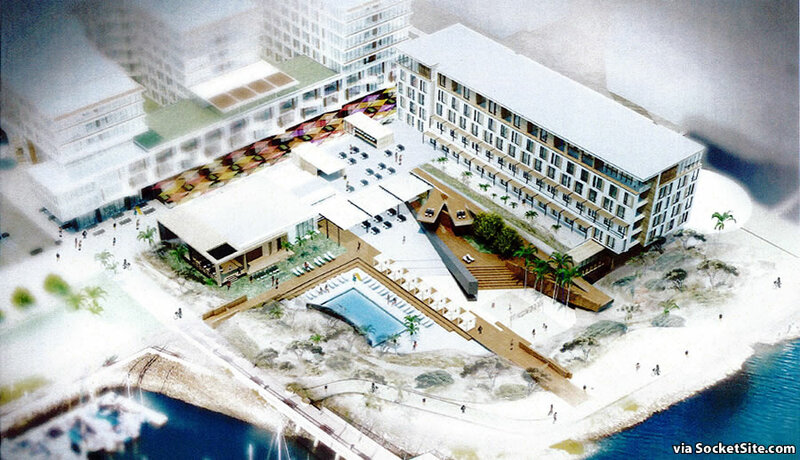 Why not a 400 to 500 room hotel on the waterfront? 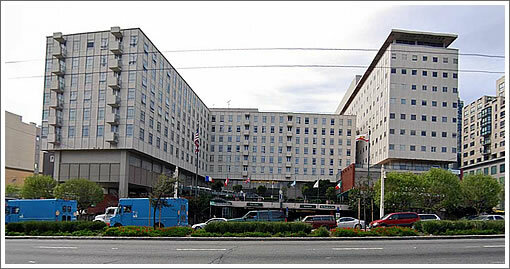 Oakland should have 12,000 hotel rooms for a city of its size, stature, and central Bay Area location. Right now Oakland has about 4,000 hotel rooms. Why waste the premiere hotel spot on the Oakland waterfront on just 160 rooms? The Bay Area and Northern California have a huge tourism industry. Oakland is closer to Napa, Monterey, and Tahoe than SF, and is 15 minutes by BART from SF attractions. 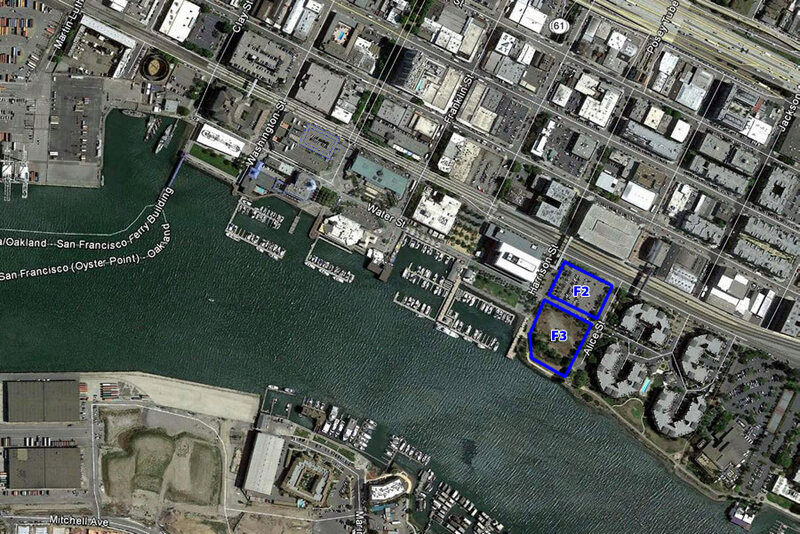 Why isn’t Oakland getting a 500 room Intercontinental Hotel on this prime waterfront site? I once stayed at a very nice Intercontinental Hotel on a Boston inlet smaller than the Oakland Estuary. Why is Oakland so underestimate and underserviced by the hotel industry? The City’s approved plan for the Jack London District only allows for the development of up to 250 hotel rooms upon the F3 site but also allows for up to 30,000 square feet of conference/event space versus the 4,000 as proposed based on the current economic landscape as forecast by those making the actual investment. That being said, keep in mind that the CIM group is developing the F2 site as well and the economics of unobstructed views from the F2 project are now factoring into their programming for the F3 site. When ever is CIM going to break ground on the long-stalled Block 1 Mission Bay hotel? I think the hotel was originally set to have its grand opening in 2017 but, obviously, plans changed. Just a guess, but maybe it was pushed back as the Giant’s Mission Rock project was being pushed back and the Giant’s want the hotel to go up concurrent with Mission Rock construction? Thanks for the background information. I would suggest to the City and the developers to go slimmer and taller on both projects. The views would be better for both projects and Oakland would get the badly needed 250 hotel rooms zoned for the parcel. The larger slimmer taller hotel could be place further east while creating more space for a larger plaza and pool area. This would create better views for the hotel while also leaving views for the F2 project. Oakland needs every hotel room it can get. Let’s also keep in mind that if the Oakland A’s build either at Victory Court, Laney, or Howard Terminal, Oakland is going to need many more large hotels at Jack London Square, and Downtown. Just 155 rooms at this prime site makes no sense. Little Emeryville, with no BART stations nearby has more substantial and larger hotels than Oakland. The redlining and underestimating of Oakland by the hotel industry needs to stop. Why would an A’s stadium require more hotels? To house out of town guests who would now come to enjoy a ballgame as well as all else that Oakland offers. They would be in the center of the city closer to restaurants, theaters, Lake Merritt, etc. Hotels are not built to support stadiums. there simply is not enough traffic generated by them to justify a hotel on that alone. 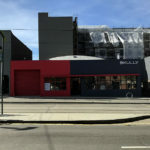 I would agree with you; and indeed that’s the folly behind all of these “ancillary development” (restaurant, stores) ideas that we so often see floated, but seldom – if ever – built. But that having been said, if there was otherwise unmet demand, the prospect of solid bookings on ~80 dates might be enough to tip the scales toward development. Apparently I’m in the minority but I think this looks like a fantastic project. If executed even to an average condition for this type of thing, this will draw a big following…there’s nothing like it on any major waterfront. This will be very, very popular and definitely draw people outside of Oakland to come visit. I also think this is a “good thing”. Room for improvement, sure? But overall a great addition to JLS (which desperately needs better hotel space), yes I think so. I find myself in the rare position of agreeing with E. Gonsalves – my first reaction to the renderings (and before seeing any comments here) was “suburban motel” – I think this is a classic example of something that will look woefully underbuilt (and dated) in just 5 or 10 years’ time. Oh look! The Jack Tar Hotel has risen from the grave. Sure about that? Maybe in concept sketches, but in reality the Cathedral Hill Hotel (as it was known at time of the demo) was a dump on a busy street and not a glassy structure along a body of water. You don’t see the similarities? Discounting the location and the lack of a glass facade, they look strikingly similar. I see the same thing you do – in those few seconds before I hastily cover my eyes again: a checkerboard pattern of various sized windows inset into white walls; I’m no sure where this “glassy structure” that others are mentioning is located, unless they mistakenly think that building in the background – F2 – is part of the project. That Cathedral Hotel is depressing. What an eyesore that was. The proposal in Oakland is much nicer. My complaint is really more about not utilizing the site to its full potential. Oakland needs more than 155 rooms on that waterfront site.